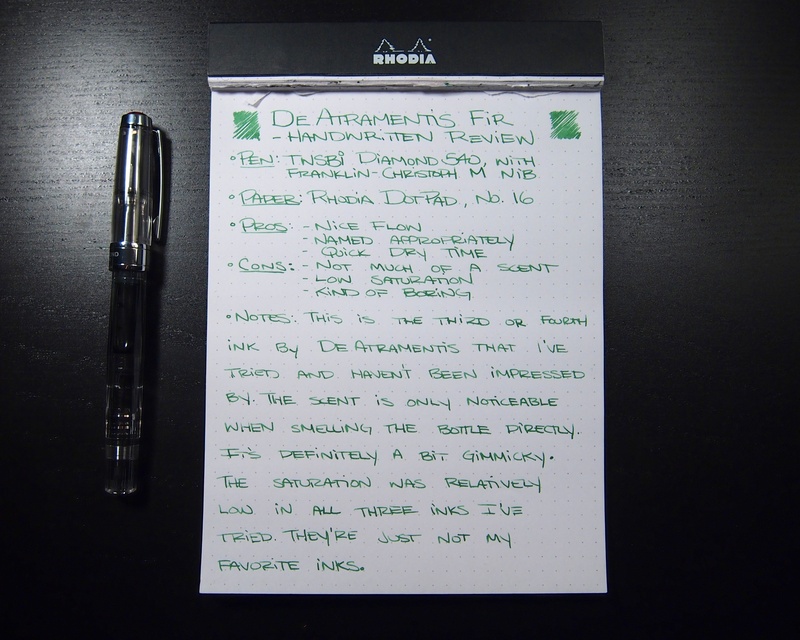 Notes: I had been initially drawn to De Atramentis’ scented inks because I thought it was a great idea to add a scent to a fountain pen ink. 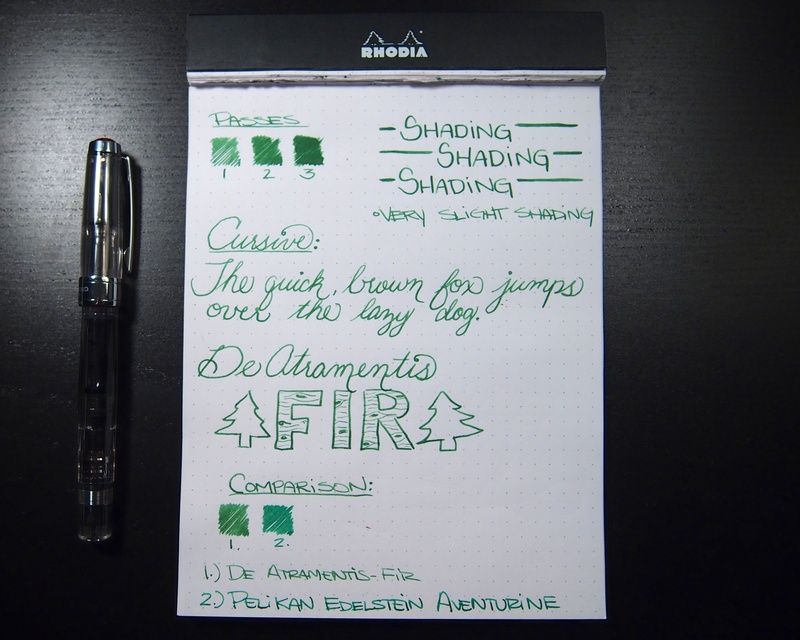 I thought that it would be cool to be able to smell the piney fir scent while writing in a nice shade of green. Unfortunately, the addition of scent didn’t really impress me all that much. The scent is very weak, and I could only really smell it with my nose up against the sample vial (yes, I also ended up with a semi-circle of green ink on my nose. awesome). I couldn’t detect any of the scent while writing, perhaps it would be more evident in a Pilot Parallel or a BB nib, I’m not sure. The ink itself performs okay, but overall I found it to be a bit watery. The shading is decent, and it’s a pretty pleasant shade of green. This is the third scented ink from De Atramentis that I’ve tried, and the third one that left me kind of disappointed. This ink falls somewhat in the middle for me, not terrible, but nothing to write home about (awful, un-funny pun.). I don’t think I’ll be trying out any more of the scented offerings from De Atramentis, but if it’s something you’re into, check it out. 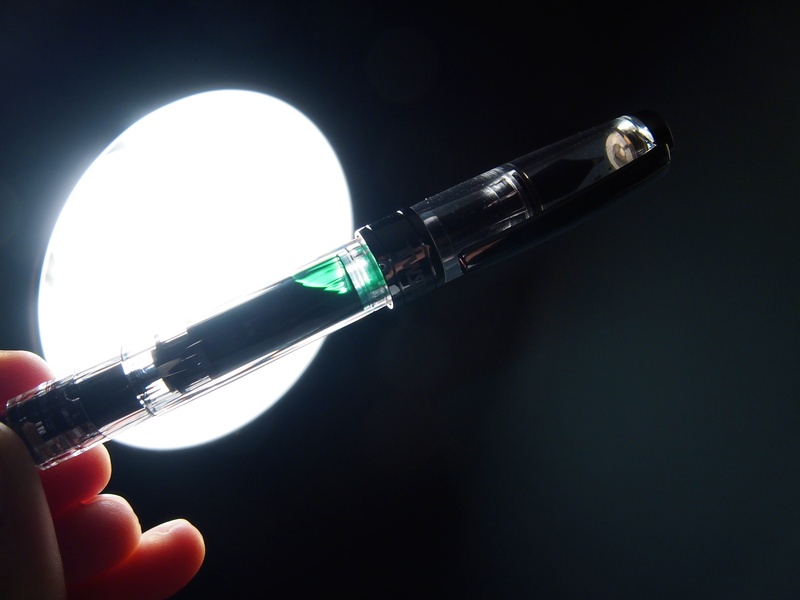 I much prefer Pelikan Edelstein Aventurine. 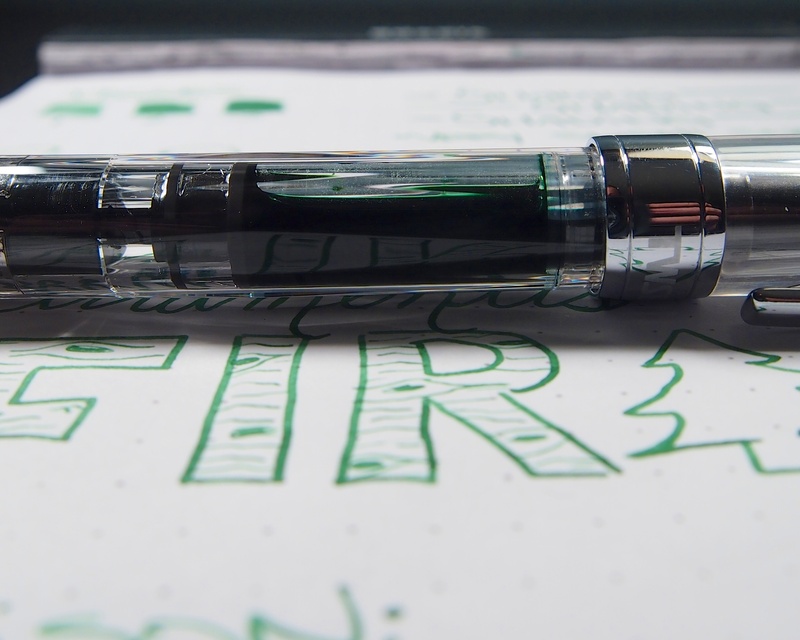 It’s a shame that this ink fell a bit short for me, as green is one of my favorite colors. This ink can be built up pretty nicely. There’s an obvious difference between passes, which is nice. It also dried quite quickly. There was a slight amount of shading there, but nothing crazy. 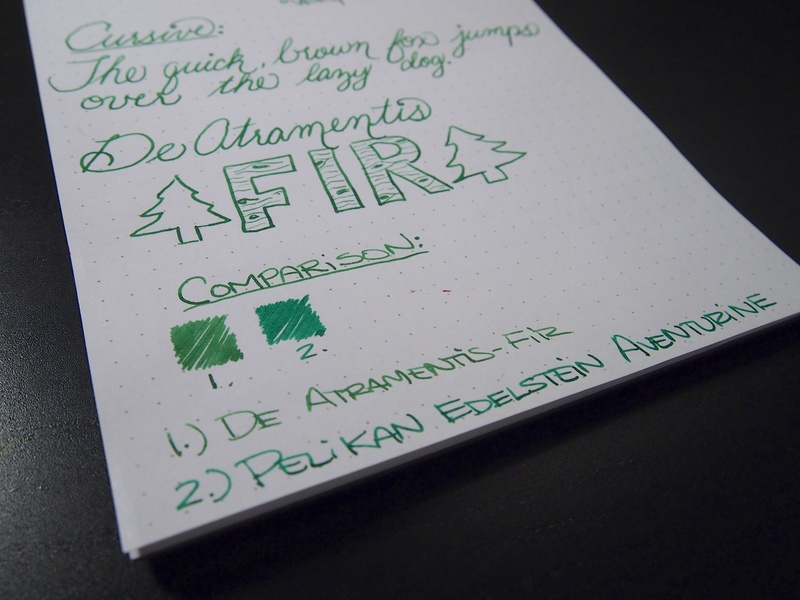 De Atramentis Fir – looks nicer sloshing around in a demonstrator than it does on the page, I think so at least. It’s a shame that it didn’t really smell like anything – I think it would be a neat ink to use at the holiday season if it lived up to its scent. I do love the color though. Dark emerald greens are my favorites. Thanks for sharing this with us! It would definitely be nice to use if the scent lasted. I think it would be nice to open up a letter or something written in green ink that smelled of fir, sadly I don’t think it’s capable. The color is pretty nice though, I just have a few that I like more. Nice review. I also was not as fond of this ink. 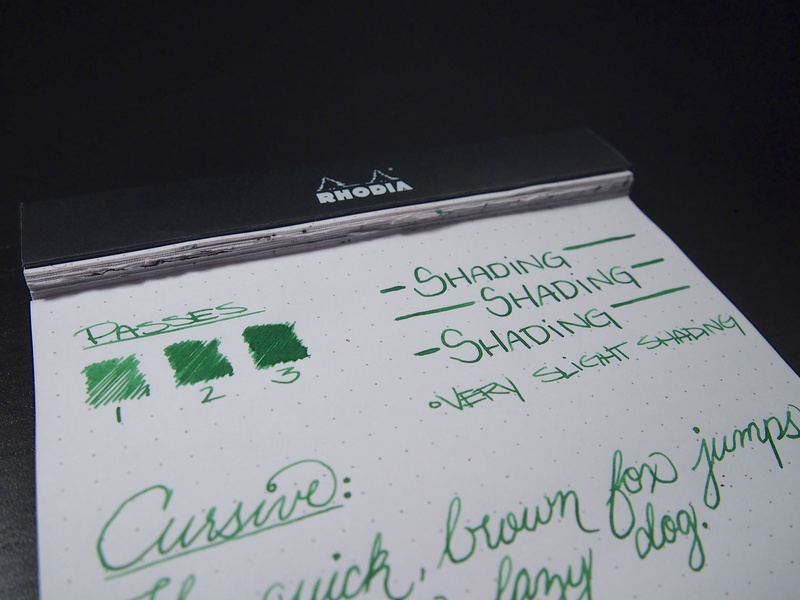 I like Noodler’s Gruen Catus Eel, Caran de’Ache Amazon and also Adventurine. I tried out the Gruene Cactus Eel and it dried a bit too slow for me, nice color though!